On the following pages you can read more about our equipment we are using on our longer hikes. 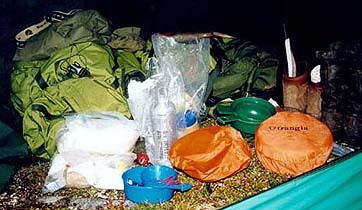 The lists are composed from many years of hiking in woods and mountains. Often good products cost a lot of money but if you buy one product every year you won't notice the cost. And you can usually use the equipment during "no hike time". And it's allways better to buy quality products instead of cheaper ones. Most of our equipment is over five years old and are still in perfect condition. You need a lot of equipment when you are hiking. We have chosen to split our equipment in different groups. Clothes - Everything you wear on your body. Personal - Your personal equipment like backpack or sleaping bag. Common - Equipment that you chare in the group. Sanitary - Here you find everything for taking care of your body. Finally you will find a check-list to use so you wont miss anything at home while hiking.